Many businesses grow organically, over time, often without adaquate planning, using business processes and IT Systems which don't support the business leaving it to flounder while competitors seem to thrive. 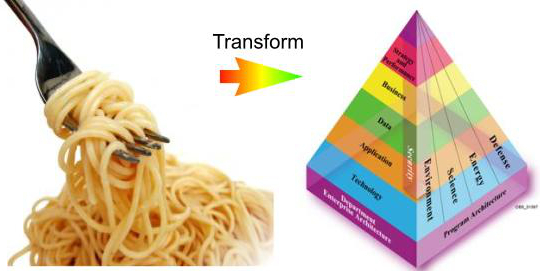 With more than 50 years of collective experience in Business, Systems Architecture and Engineering our team can assist you to transform spaghetti like systems into modern, efficient, human friendly, business enabling systems which make you money and your staff happy. When we refer to Systems, we don't nescessarily mean Computer Systems, rather the Business Processes, Human interactions, Information flows, Data storage, Technology platforms, Service delivery, Efficiencies, Life Cycles and Continuous improvement. Does my business run like a well oiled machine ? Are my staff happy and do they like working here ? Would I like to work here if I didn't own / manage the business ? Are we as efficient as we could be ? Does our IT System support what we do, or does it just cost us money ? If you answered NO, or were not certain about any of the questions posed above, Click Here for help.